Desperate for a strong performance from its defense, Oklahoma found the perfect opponent in Kansas' feeble offense. No. 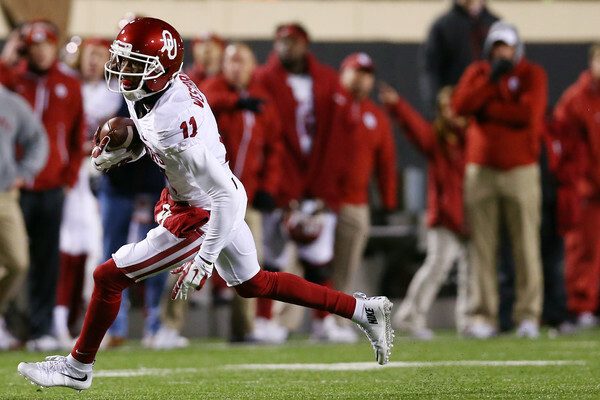 16 Oklahoma's offense did its usual thing — rolling up 538 yards — in a 56-3 rout of Kansas. Baker Mayfield threw for 236 yards and four touchdowns and receiver Dede Westbrook scored on a 71-yard punt return and a 41-yard reception for Oklahoma (6-2, 5-0). But the Sooners' defense — much maligned after allowing 854 yards a week earlier in a 66-59 win over Texas Tech — also did its part this time, limiting Kansas (1-7, 0-5) to 170 yards, the fewest by an Oklahoma opponent this season.